The mild start to 2013 was nice and judging from the sight of new growth coming through in the natural world, although some trees and flowers were tricked into thinking spring had arrived, I wasn’t fooled. The transition from mild to cold was very sudden and extreme. Literally one day we were basking in air temperatures comfortably into double figures – even scraping 10 during some nights – and the next we’re into minus overnight lows. Although the water temperatures won’t fall as rapidly, they will start to drop in due course. And with temperature trend being a key factor in the overall application of the statistics, all in all it meant a tough time ahead. Moving on from the carp fishing I did at the start of the year, I switched to a more traditional winter species. Esox lucius. The pike. 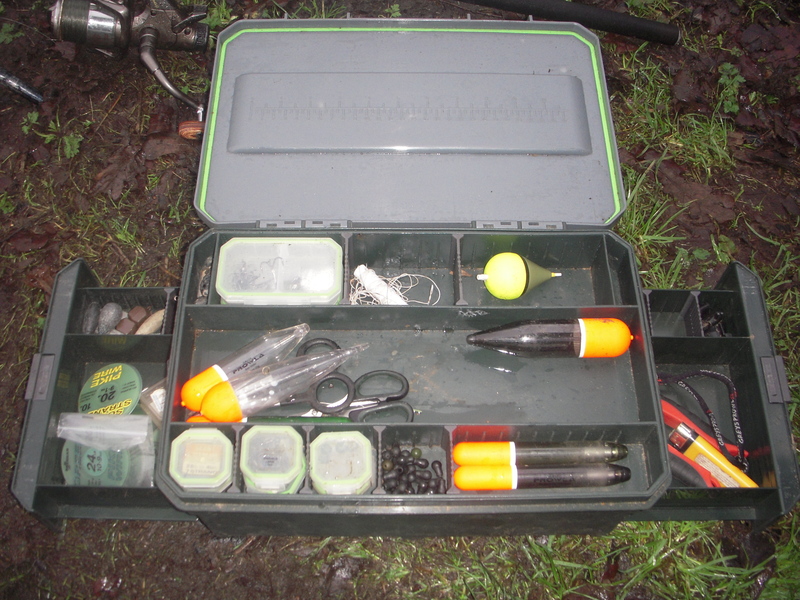 As you can see from the photo above, my pike tackle box is reasonably tidy. I didn’t clean it up for the shot, that’s how I keep it. Whilst we think of habits usually in the negative, there is such a thing as a good habit. And one is to keep your tackle tidy and in a place where you can go straight to it. It makes fishing easier. So what were my pike plans and how did I get on? As well as my tackle being organised so is my daily schedule, so I’d got sorted. Three consecutive mornings on the canal and then office time in the afternoon. I run a Christian-based charity that works mostly in Africa, I work from home and run my own schedule, so I have lots of flexibility. 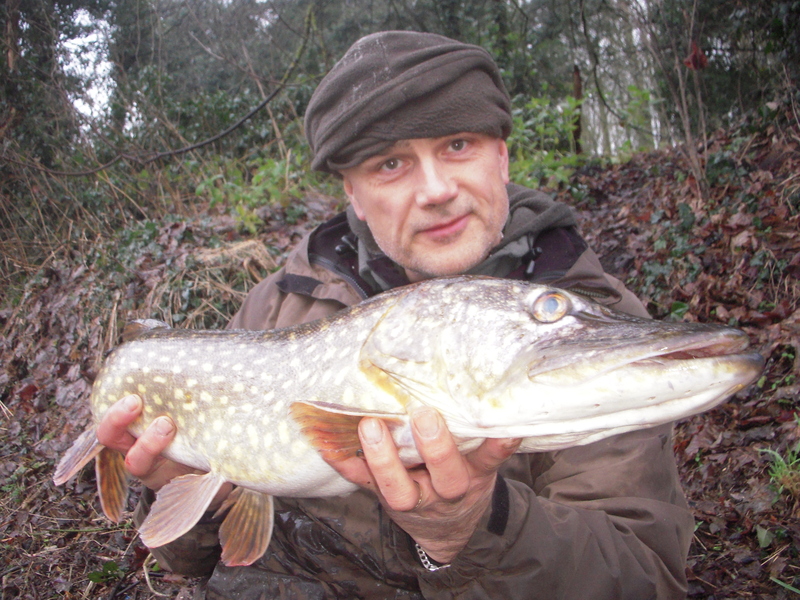 My approach was very simple and straightforward – float-fished deadbaits. Although I varied the bait, with sardine, bleak and roach featuring, the general approach was the same each time. 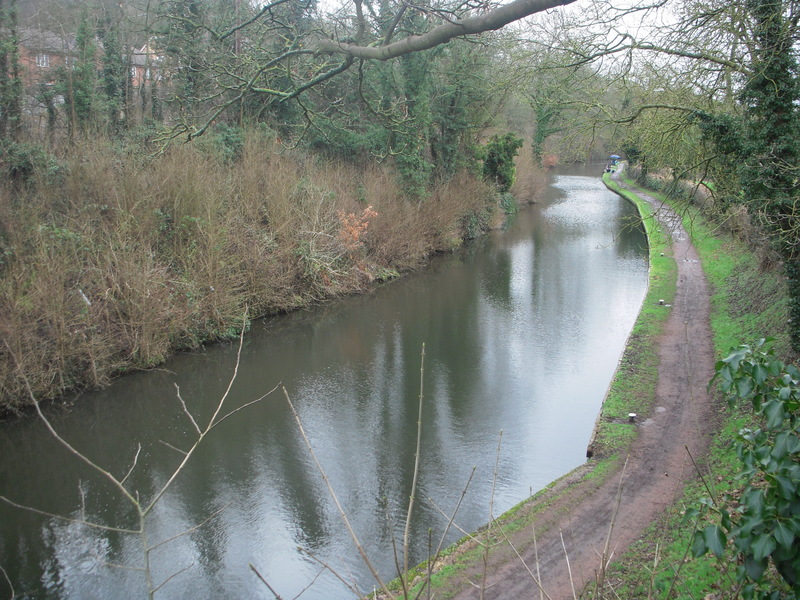 I had the canal to myself, well at least as far as the eye could see anyway, so I was able to cast around. Usually you have to go to the fish instead of expecting them to come to you. That applies to all species and styles but especially winter deadbait piking. The first two outings I drew a blank. But that didn’t bother me. As an all-year-round, all-weather specimen angler it’s just part of the journey. Not to mention the fact that the places I fish aren’t exactly wall-to-wall pike. In fact several times I’ve been fishing somewhere and a passer-by (who is obviously an angler) gives a little laugh and says ‘There’s no pike in here mate’. I just give a little laugh back. And change the subject. 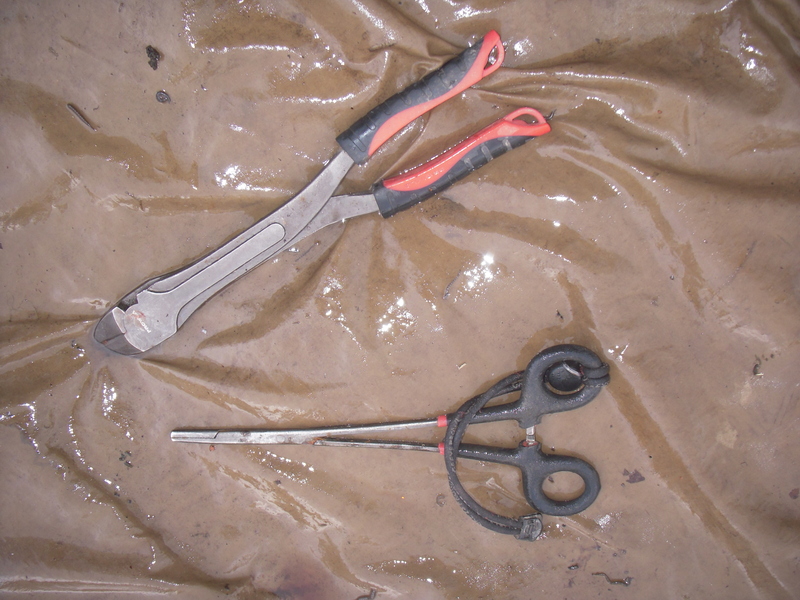 Part of the angling organisation I mentioned previously is to ensure your unhooking mat is already laid out with forceps and side-cutters at hand. The latter, of course, should you need them. They’re like a car insurance policy. You need it but hope you don’t have to use it. Always lay your mat out on a level place if possible, positioned in such a way that you can lift the fish straight from the water onto it. And that’s what I was doing just 15 minutes after casting out the sardine, as a slight float movement became a tremble which led to a full take. Just to catch is great where I was fishing, so to get one after very brief snow, sleet and rain had battered me was a double bonus. 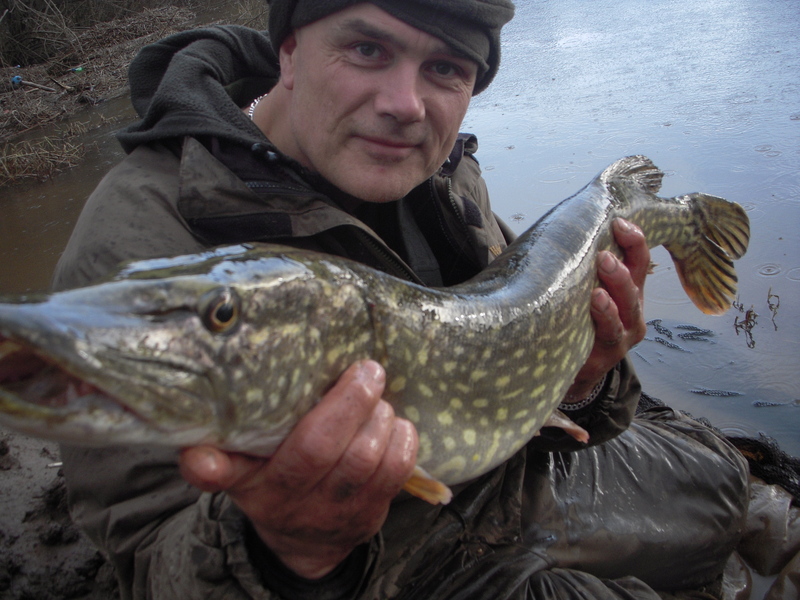 The cold toes and fingers were momentarily forgotten as I netted a decent pike for the venue. I do have lots of proper clothing gear but ultimately sitting in minus temperatures for hours on end obviously has some effect on your body. No more fish or even enquiries, again highlighting that fine line between a good day and a blank. My next session saw me on the Severn. The forecast was for proper snow and I love fishing in a white landscape. Although I had a little on the canal, the sleet and rain that followed meant I had no snow backdrop photo. I love fish shots in those conditions. Sadly though, even though we did get snow overnight, by the time I started fishing rain was falling and when I caught it was a muddy backdrop as opposed to a winter wonderland. Due mainly to the level of the River Severn – i.e. in the fields – but also that I’ve been enjoying my canal and stillwater fishing, this was my first flowing water session of the year. The level was about a foot up on normal winter level, but falling. There was a slight colour, enough to persuade me to fish with the more visible sardines. The other bait I had brought with me was perch. It’s always good to have another option available anyway. It was still morning when I caught the first fish. In the net, on the bank, photographed, and back it went. With the banks becoming very slippery and yours truly more muddy than he’s ever been in his life, the second fish was netted. I dropped my camera in the mud and that finally saw it off. Just enough time to get a shot of the fish. Not the best of photos but at least I got one. The weather, having taken a downward leap from mild to very cold, progressed even further on that road as heavy and persistent snowfall hit the area where I live. 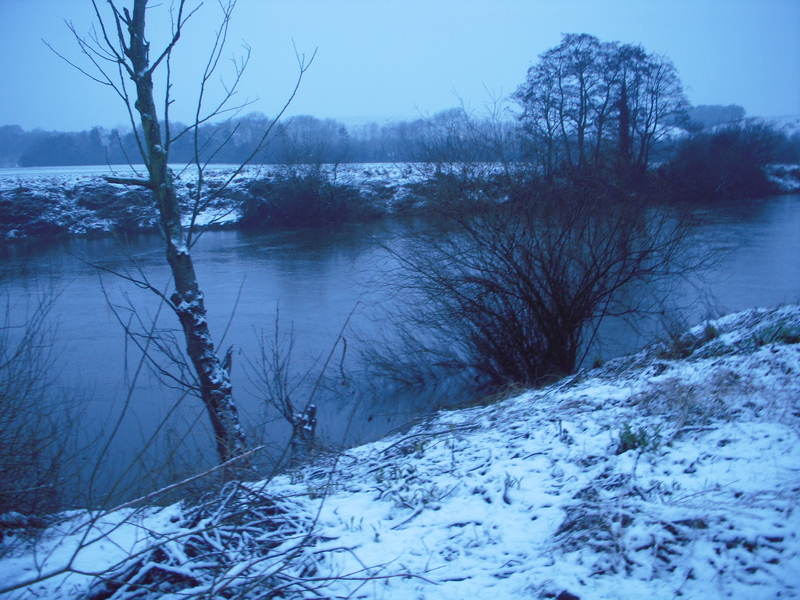 I managed my final session on the Severn, just before the white stuff fell in quantity, but blanked in the icy conditions. The thing is, I really do love fishing in the snow and adverse conditions never put me off anyway. The big problem I have is where I live. 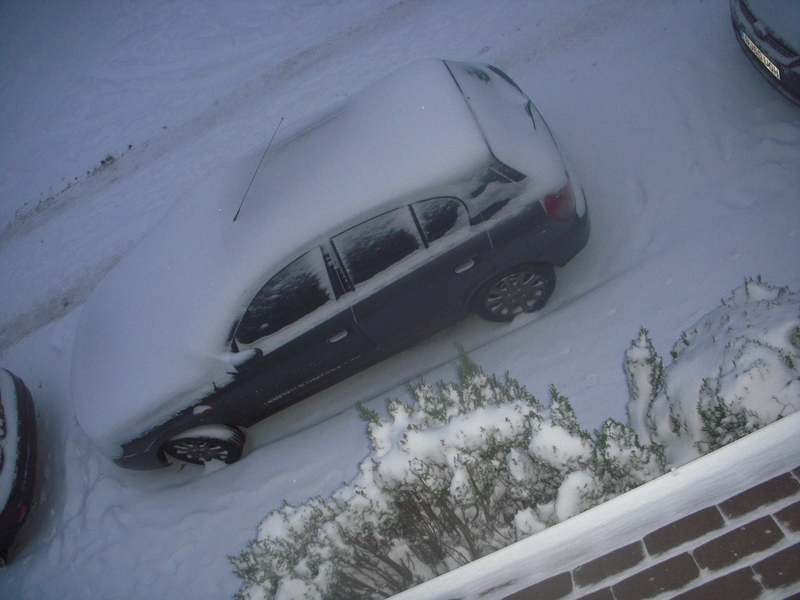 I’m on high ground – my house is on the English watershed – so get a fair share of snow. In addition, when all the stillwaters are frozen, as they are now, the nearest river is a 20 mile round journey. I’m absolutely passionate about my fishing but I’m also level-headed.